Painting, sculpting, photographing, and otherwise creating art is not the only benefit of art. We know now that enjoying art—appreciating and discussing art with others—is also therapeutic for people who have dementia. Indeed, it is therapeutic for us all! There is indeed a wealth of research, as well as anecdotal support for the confidence that the Society for the Arts has in the positive affects creative activity has for the person with dementia. An excerpt from the documentary film, I Remember Better When I Paint (below) demonstrates this affect; to see otherwise despondent people come to life, become active and social and verbal, is nothing short of amazing. Please take the time to view this three minute clip, or come back to it when you have time. It will convince you that an art program will benefit the individual with Alzheimer’s disease, possibly in a very big way. No drugs yet exist that can effectively prevent or cure Alzheimer’s disease. What recourse, then, for the millions of people who suffer from this terrible degenerative disease, which causes a progressive decline of cognitive skills, memory loss, and withdrawal? It is becoming increasingly evident – initiatives that help people with Alzheimer’s get involved in art and other creative activity obtain surprising results. Scientists have discovered that Alzheimer’s disease normally spares, to a very large extent, the parts of the brain related to emotions, creativity and creative expression. Neurologists — including several who are interviewed in the documentary — recognize the benefits of non-pharmacological therapies. Nonetheless, only a very small percentage of nursing homes and care facilities are yet making effective use of these approaches, and the film urges that an extensive effort now be made to share these positive approaches and hopeful possibilities. It is becoming increasingly evident – initiatives that help people with Alzheimer’s get involved in art and other creative activity obtain surprising results. When working with people who have dementia, it is far more productive to communicate using emotional and creative centers rather than logic and memory centers. This is why art therapy for Alzheimer’s is such an effective means of improving quality of life. Now we must make an important distinction. Painting a picture is not necessarily art therapy, in the strictest sense, regardless of the benefit derived from the process. The American Art Therapy Association claims that “art therapy can only be practiced by an individual who possesses the required training, certification, and/or state licensure. Bona fide art therapy is beyond the scope of practice of non-art therapists.” Art therapists are highly trained, knowledgeable practitioners. To be recognized by the Association, a therapist requires a master’s degree and hundreds of hours of supervised practicum. It is likely beyond your budget to have a weekly session with an art therapist, but one could help you set up and supervise your program. If even this isn’t possible, or practical, Memories in the Making (MIM) can help. Based on a program developed by the Alzheimer’s Association of Orange County, this book was written to help harness the amazing healing properties of art. If you are caring for a loved one at home, MIM can help you understand and implement a small scale but effective program. Even then, and if you can, watch for art therapy sessions in your community (library, etc.) . We can create our own art or music or stories, or we can enjoy those things that others have created. Both activities can provide an enjoyable diversion for any of us, and both are therapeutic for the person with Alzheimer’s disease. National Institutes of Health: Art therapy is a mental health profession that uses the creative process of art making to improve and enhance the physical, mental and emotional well-being of individuals of all ages. Art Therapy Credentials Board: Art therapy is a human service profession in which clients, facilitated by the art therapist, use art media, the creative process, and the resulting artwork to explore their feelings, reconcile emotional conflicts, foster self-awareness, manage behavior, develop social skills, improve reality orientation, reduce anxiety, and increase self-esteem. American Medical Association and Health Professions Network: Art therapists use drawing, painting, and other art processes to assess and treat clients with emotional, cognitive, physical, and/or developmental needs and disorders. American Art Therapy Association: Art therapy is the therapeutic use of art making, within a professional relationship, by people who experience illness, trauma, or challenges in living, and by people who seek personal development. Through creating art and reflecting on the art products and processes, people can increase awareness of self and others, cope with symptoms, stress, and traumatic experiences; enhance cognitive abilities; and enjoy the life-affirming pleasures of making art. 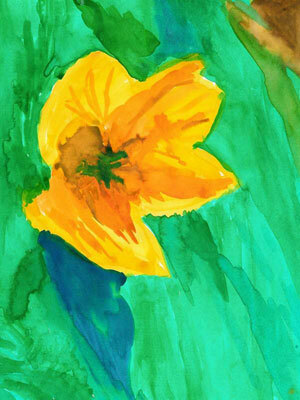 Lemon Yellow Flower Floating in a Pond A painting done by a participant in a Memories in the Making program. feelings that we may not be able to express in any other way. Sometimes words fail us. Read more about creating art as an activity for people with Alzheimer’s disease. Art therapy for Alzheimer’s can come in many forms. 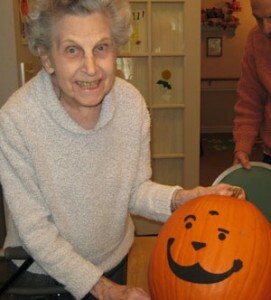 Here Bernice proudly displays her Jack-O-Lantern. Art or creative therapy for people with Alzheimer’s disease need not look the same as art (say, an art class) might look for someone else. Bernice had always been a creative lady and also a perfectionist. At one point when Bernice was in a memory care community, Holly brought an adult coloring book for her. It had pictures of people dressed in fancy clothes. Holly got out some markers and asked her if she would like to color. It was always a challenge to get Bernice to do anything like this — she did not want to risk making a mistake. Holly moved the coloring book aside for a while, and they talked. Before long, Holly slid the book back in front of herself, picked up a marker and started coloring. Bernice was obviously interested. Holly asked, “What color do you think this should be?. She didn’t like to make mistakes, but Bernice was never shy about offering her opinion. They finished the page in this way; Bernice chose the color for each area and Holly filled it in. Choosing the colors was Bernice’s creative process, her art therapy. Bernice couldn’t have been more pleased with the finished picture if she had done it all herself! As with everything else when working with persons with dementia, be prepared to modify the task or activity to satisfy the individual’s interests and abilities. It helps to know as much as possible about the person you are working with, but it also requires observation and experimentation. If something is not working, or not being accepted, try using it or doing it a little differently. Or put it away and try something else. Maybe this activity is for another day. It is important to remember that in this context we use the word “art” as a verb; art is a creative process, not a product. If a person is enjoying her art experience, if it helps her to communicate what is inside of her, if she takes pride in what she is doing, it makes no difference what it looks like when it’s done. All you need to start an art program at home. The Watercolor Art Kit pictured here and available in our store, contains everything you need to start your own program; a set of 18 vibrant watercolors, 7 quality brushes with comfort grip, colored pencils, pencil sharpener, 3 water bowls, a pad of watercolor paper (10 sheets – 9″x12″). And comes in it’s own storage box. This kit makes art therapy for Alzheimer’s easy for you! Would there be interest in my senior living coloring book which is designed for using crayons ? All subjects are basic and recognizeable, and on quality paper. I’ve been teaching and painting over 25 years and these drawings have been used successfully…..
Also finishing another book for coloring and mind boosting for Early onset of Alzheimer’s, as my mother in law has been diagnosed and loves to color with me. I’m looking for free art material seniors in the oakland ca area. We are starting a art and craft class in our senior building next month. Would appreciate all the help we can get. Thank you. I work in an aged care facility in hervey bay qld australia and would like to introduce art therapy to our dementia residents. I am currently putting forward a proposal for art workshops for all our residents but would also like ideas on how to implement art workshops directed at people with dementia. Any advice would be welcome. Hi Tracey – the best resource we know for setting up a meaningful art program, other than spending a few years getting certified as an art therapist, is the book, Memories in the Making. We sell it at https://store.best-alzheimers-products.com/memories-in-the-making.html, but you might find a seller for it in AU. My husband who is 67 was just diagnosed with early Alzheimers. I am shocked at the lack of classes and stimulation therapies etc for patients. I can only find help for caregivers but nothing for my husband. We live in Palm Harbor, Florida in the Tampa area. I know he may forget the name of a medication but will know any song, the artist and the year it was released. There has to be a way to help the person with the disease to explore stimulation etc that will help them. Your site is the only one I found. Dear Mary, My mother lives in Clearwater, so I am very familiar with your area. I would contact the Florida Gulf Coast Chapter of the Alzheimer’s Association. They would likely be able to direct you to available programs and support groups. It sounds like your husband enjoys music, so in the meantime, take advantage of the many concerts in your area. Coachman Park has free concerts sometimes. If you get the Thursday copy of the Tampa Bay Times, they have more things listed than you could ever do. Have some fun. Our beloved father was diagnosed with Lewy Body Disease in 2001. He passed away on January 23, 2016 at the age of 91. In our quest to find an activity that provided dad with enjoyment and a sense of satisfaction we discovered Portrait Puzzles. Family photos are uploaded and magically transformed into high quality puzzles. My sister and I created Pieces of the Past Puzzles and are partnering with Portrait Puzzles to spread the word about the power of puzzles. Please check our website at http://www.piecesofthepastuzzles.com. They were a godsend for our family and are now treasured more than ever, Good luck. I don’t know of anything, Jeanette, but I’ll put it out there. Maybe sombody else can help. Good Luck! and enjoy your retirement. As an artist with an interest in care work in the home, i see the benefits of painting that can be clearly seen in many cases of people with early and middle term Alzheimers. Are the side effects of the medication ( extreme fatigue for example ) that Alzheimers patients have, likely to suppress any benefits that recreational painting or stimulating brain games could give to enhance their lives. If so should the Doctors modify those medications so that the Alzheimer sufferer benefits more from activities like painting. My husband Kevin was diagnosed with early onset Alzheimers almost 2 years ago, and he is now almost 63. I am an art teacher, and trying to stay at the two schools I work for as long as possible, but recently I have considered if I could do art therapy as a job, and therefore be able to spend more time with Kevin and maybe have him working with me as an assistant. is there a program I can look into to learn more about the best ways to work with clients who have Dementia/and or Alzheimers? The best place to learn your options is the American Art Therapy Association at https://arttherapy.org.